Canteens have existed for some time and many antique silver canteens can be found. A ‘canteen’ is a British word for a box or chest containing cutlery and other table utensils. A ‘canteen’ is also synonymous with a collection of the utensils themselves. Knives have been used as tools, weapons and eating utensils since prehistoric times, yet it is only in more recent times that knives have been used specifically for table use. Around 3000 – 700 BC metal blade knives were originally made from copper and then bronze until it was discovered that iron provided a sharper, longer-lasting knife edge. During the Middle Ages (500 AD – mid 1400’s) knives were a uniquely personal possession retained by ‘the owner’ for individual use. (It was not unusual for a person to be buried with their personal eating knife). These knives had a sharply pointed blade used to spear food to transfer it from the plate to the mouth. With time, knives with blunt ends, wider, curved blades and pistol grip handles were made to facilitate taking food to the mouth in a safer fashion. Eating forks were produced many years after knives had been in regular use for food consumption. Although the fork gained acceptance in Italy by the late 1500’s, the earliest two prong fork to display English hallmarks may be accurately dated as 1632. Originally, in the 1600’s fork tines wore down quickly as they were manufactured in steel, so silver became the metal of choice. Price then became a limiting factor. 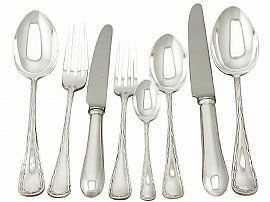 Individuals were accustomed to eating with only knives, spoons and fingers, so forks did not become de riguer until the late 17th century, and even then the cost excluded the lower classes from owning such utensils. 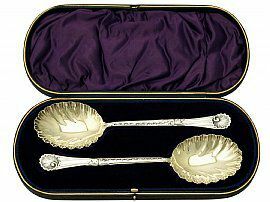 Only in the 19th Century, with mass production and the introduction of the electroplating process did silver forks become available to the middle classes. Handles were no longer fashioned in solid silver, but organic materials such as bone, ivory and mother of pearl, further reducing costs and thus increasing availability to the masses. The curved fork recognised today was developed in Germany in the mid 1700’s. Originally spoons were crude pieces made of shell or bone. Even when knives were made of metal, spoons continued to be made from more organic materials. 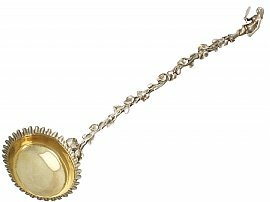 The Romans introduced pewter, bronze and silver spoons to Britain in approximately 50 AD. Like knives, spoons were originally items kept for personal use alone. From 500 AD onwards, the Vikings and Saxons introduced more decorative spoons with leaf-shaped bowls and carved ends, but it was during the Cromwellian period in the mid 1600’s when the bowl of the spoon became more ovoid in shape and the spoon handle flattened towards the end, becoming closer to the familiar shape recognised today. As with knives, spoons were initially personal possessions, representing a degree of personal prosperity.